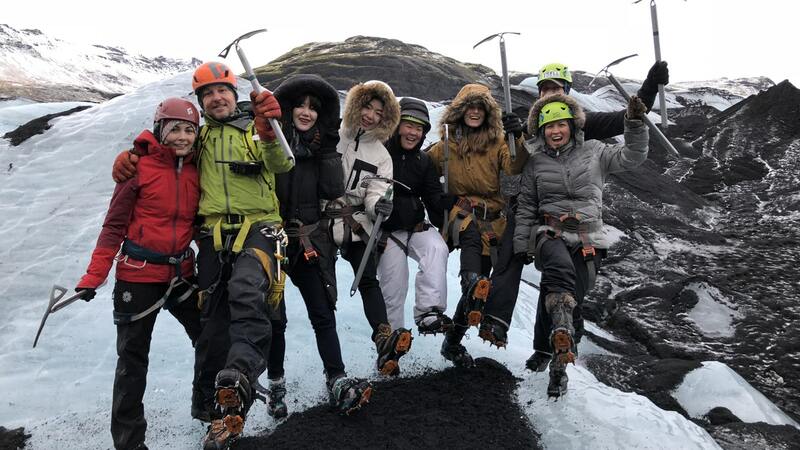 The Skaftafell Ice Climbing and Glacier Hike tour is a great addition to a day in Skaftafell. 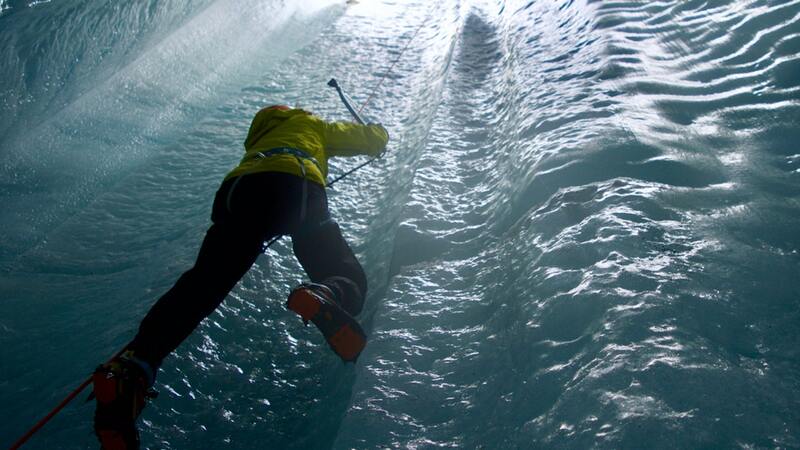 As the name suggests, this comprehensive tour combines ice climbing and glacier hiking. The setting is Svínafellsjökull glacier, which is part of the biggest glacier in Europe, Vatnajökull glacier. The glacier offers breathtaking views as you hike and climb in this epic landscape. This glacier and its landscape have provided a backdrop for dozens of movies and TV shows like James Bond, Interstellar, and Game of Thrones. The meeting point for this tour is at the Skaftafell Visitor Information Center. From there you’ll take a 10-minute drive up to the starting point for the glacier hike. You will walk to the edge of the ice where you’ll gear up and get ready for your adventure. For the next 2,5 – 3 hours you will hike and climb on the ice, seeing plenty of beautiful features as you go. During the tour you will also learn more about the history of the glacier, it’s environment and landscape. Is transfer included in this tour? Transfer to Skaftafell is not included in this tour. This tour is meet-on-location only. Where is the meeting point in Skaftafell? You will meet your experienced guide at Skaftafell Information Centre Parking lot and from there you will be driven to the root of Svínafellsjökull, which is an outlet glacier of the Vatnajökull Icecap. Do I need any previous experience to participate in this tour? It is perfect for everyone as the experienced guides can adapt it to all needs and expectations. The only thing you need to bring is patience and a small portion of endurance to climb to the top of the ice wall! The tour takes about 4 hours to complete, including transfers, safety briefing and gearing up. Time spent on the glacier itself is about 2,5 – 3 hours. 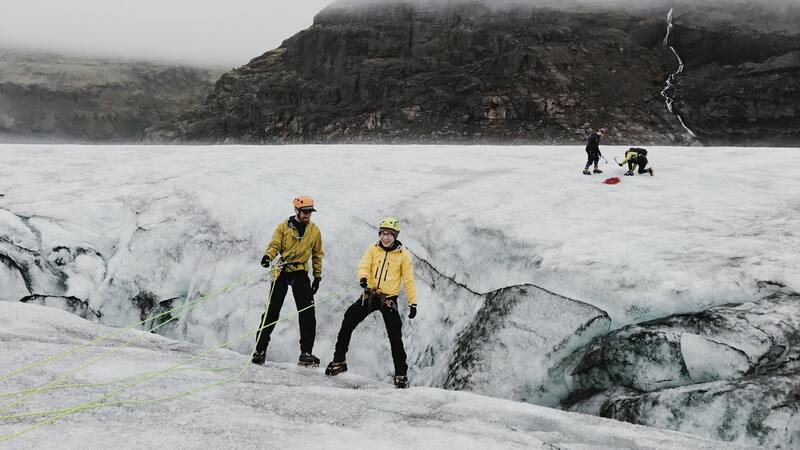 How do you ice climb on a glacier? Since the glacier is impermanent and ever-changing your guide often has to scout out a new crevasse or moulin for climbing each time. With this strategy, the tour is flexible and tries to avoid the crowds on the glacier as well. 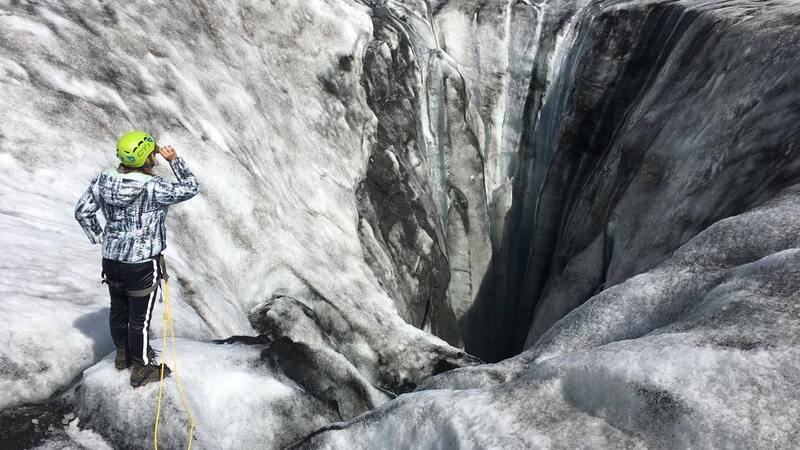 Your guide will install a massive ice screw and attach a rope to them before you climb up the ice wall or even rappelling into a crevasse and climb down again. Is safety gear included in the tour? Yes, you will be supplied with hiking boots, crampons, ropes, helmet, harness and ice ax. You should wear warm clothes as your first layer and waterproof clothing as your second layer. You should also wear gloves to protect your hands and a warm hat. We also recommend packing sunglasses for this tour. The meeting point for this tour is at Skaftafell., just a few meters from the Skaftafell Visitor Center. Please note that you must be on location at least 15 minutes before departure. It takes about 4.5 hours to drive to Skaftafell from Reykjavík in good conditions. From Höfn, the drive takes about 2 hours.